The Smart™ Marine Accounting and Financials, is globally acknowledged as a "breakthrough" benchmark financial system and is widely accepted by all major Auditors as complying with international accounting practices. Representing a unique framework for supporting the organization and integration of all financial information of a maritime company, the system assists the daily operations of the Accounting Department in the most efficient and effective way and provides an indispensable and comprehensive managerial decision-making tool. Through the incorporated Smart Budget module the User can prepare a budget for each Profit & Loss account according to the requirements of the Company. Budget amounts can be defined for the accounts related to vessel's running expenses, vessel’s voyage expenses, vessel’s or Company’s income as well as office administrative expenses. 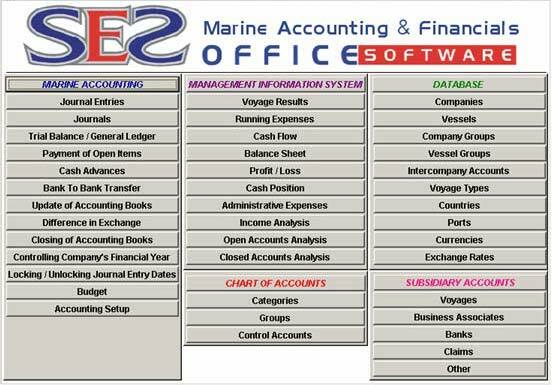 The Smart™ Marine Accounting and Financials features powerful MIS capabilities that enable the maritime Company’s top management to have all the key information relating to the financial status of their business, readily available at their fingertips. The information is integrated from one source (the Accounting journal entries, budget and other systems) and facilitates accurate and quick managerial decision-making.